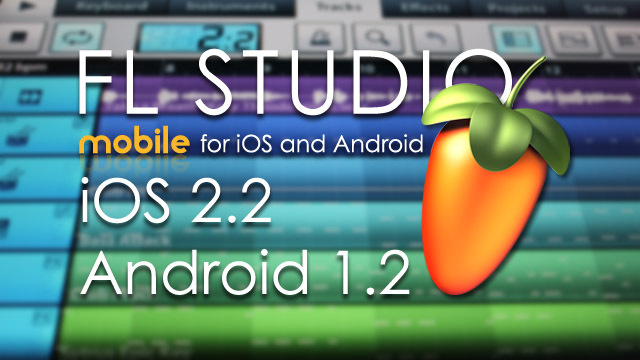 We are pleased to announce the FL Studio Mobile 1.2 for Android and 2.2 update for iOS. This is a free update for existing FL Studio Mobile customers. While projects, .flm format, are compatible between Android and iOS, if audio tracks are present they are ignored. If instruments are not available the MIDI data is loaded and the a default instrument is used. Check the online version of the users manual here for more details. * FL Studio 11 or higher for Windows required. The FL Studio Windows version (sold separately) is installed, on average, over 30,000 times each DAY making it one of the world's most popular and exciting music production systems. Everything you need in one package to compose, arrange, record, edit, mix and master professional quality music, the perfect studio partner for FL Studio Mobile. You can download the demo version of the FL Studio for Windows and enhance your FL Studio Mobile projects for free then save to .mp3, .wav, .ogg or .mid format. We are excited to announce FL Studio Mobile 1.1.1 for Android devices available now from the Google Play store, in addition to the iOS version from iTunes for iPod touch, iPhone & iPad. The Android version now gains the ability to create and save your own instruments. PS: Don't forget to check out the FL Studio Mobile demo song contest! See the manual here on how to create custom instruments or see a video here. Effects include Limiter, Reverb, Delay, EQ, Amp simulator & Filter to enhance your mix. OS: Android 2.3.3 or higher. Screen resolutions: Works with all screen resolutions but is optimised for 1280x800, 800x480, 960x640 and 480x320. CPU: Multi-core supported. The faster your Android device the more you can do with FL Studio Mobile. While projects, .flm format, are compatible between Android and iOS, if audio tracks are present they are ignored. If instruments are not avaiable the MIDI data is loaded and the a default instrument is used. It's here! FL Studio Mobile 1.0.1 for Android devices available now from the Google Play store, in addition to the iOS version from iTunes for iPod touch, iPhone & iPad. You can now create and save complete multi-track music projects on your Android 2.3.3 or higher phone or tablet device. You can even load the FL Studio Mobile projects into the 'FL Studio Desktop PC' version* and take them to the next level. * FL Studio 10.9 or higher for Windows required. The FL Studio Windows version (sold separately) is installed, on average, over 30,000 times each DAY making it one of the world's most popular and exciting music production systems. Everything you need in one package to compose, arrange, record, edit, mix and master professional quality music, the perfect studio partner for FL Studio Mobile. You can download the demo version of the FL Studio for Windows and enhance your FL Studio Mobile projects for free then save to .mp3, .wav, .ogg or .mid format.